Limerick’s juggernaut is on the verge of going where few have gone before them by backing up All-Ireland success with a league title and maintaining an aura of invincibility . Aside from Brian Cody’s all-conquering Kilkenny – which achieved the feat four times – no team since Galway in 1989 has managed to do so but John Kiely’s men are out to rewrite the record books. Victory in Croke Park tomorrow would signify more than the end of a 22-year wait for league honours as elder statesmen like Nickie Quaid, Declan Hannon, Shane Dowling and Graeme Mulcahy chase a clean sweep of league, All-Ireland and Munster titles. Kiely strikes me as a man that attacks the league with the Cody mindset of ‘Go for everything and win what we can, when we can’ and why not given that they have such a young team and an embarrassment of riches in terms of personnel. Winning breeds more success. Limerick must be applauded for how they’ve gone about their business with the title of All-Ireland champions. Hangovers are a regular consequence when a county starved of success finally breaks through, but this young team seem intent on creating a legacy akin to the Mick Mackey era. You don’t know what way young fellas will react after a life-changing success, it can go to their heads and take the edge off them but they’ve been ultra professional. They know what direction they want to go and success is all that’s on their minds. Getting their hands on silverware and winning medal after medal is all they understand from their underage days. The relationship among the panel is fascinating as well and having seen them share a moment in Áras An Uachtaráin with the President recently, they look like a group that love each other’s company. Any time a player is being substituted it’s nearly always high fives all round with players coming off smiling and almost saying, ‘That’s my job done, now you go on and do yours and finish the game off’. If they were losing, that might change but they’re on top of the world right now and securing a league title would shoot down any question marks, if there are any. Climbing the Hogan Stand steps again would further create an unbeatable aura leading into the summer and they have been a joy to watch this year. They can go through the gears when needed and the systems they play to are often delivered to perfection. Paul Kinnerk’s fingerprints are all over them and they’ve progressed from last season. Limerick can mix it in every way. They have the physicality, they have the running game, they have unbelievable stickwork and every ball seems to have a name on it when they play it through the lines before getting it into their inside line. They’re perfecting a style that is unique to them. When in full flow, they’re very hard to stop and their movement off the ball from their puck-outs is straight from the training ground. Sitting in the stand with my old nemesis Jackie Tyrrell last Sunday on radio duty, we pondered how to counteract Limerick’s movement for Quaid’s puck-outs. Do the half-backs stay and hold their line and communicate with team-mates or do they follow? A lot of teams have done the latter which plays into Limerick’s hands and they are the masters of creating space in attack. It’s nearly always at least a 60-40 ball in favour of the forward when it is played in and the attacker knows he will have an advantage on the defender so Waterford will have to be on guard for that cross-field ball tomorrow. We saw the impact of their bench yet again last Sunday with Seamus Flanagan’s goal giving them that all-important daylight, while Mike Casey returned to increase competition at the back where Paddy O’Loughlin and Tom Condon have also put their hands up as viable options. With Hannon available, Kiely has a full deck to choose from and that makes this a significant challenge for a Waterford side minus a few marquee names. So how do Waterford go about winning this game and meeting that challenge head on? They were murdered in terms of space at the back during last summer’s Munster SHC defeat to the Treaty. That’s a game that Páraic Fanning and his backroom team will have broken down in minute detail when they’re doing their analysis. Going back to Derek McGrath’s interview after that drubbing last June, he said he was very naive to buy into the public perception of playing conventional 15 on 15 after a good performance against Tipp. Waterford now find themselves in a similar predicament. Do they continue playing 15 on 15 or do they change it up for the ultimate challenge to date? The Waterford public are delighted with Fanning’s approach thus far and keeping more forwards closer to goal. Páraic did highlight that every day brings different challenges, however, and he’s very open to playing whatever way suits them on a given day. I suspect he will follow the same template which Dublin used to frustrate Limerick last Sunday. It worked a treat for nearly 50 minutes and involves clogging up the middle third and playing an extra man at the back at times and tomorrow might be the right day to go back to the sweeper. It could work well early to stay in the game and it is a system that can cause Limerick trouble. Wexford troubled Limerick in their opening league game with the same approach and Clare used a similar template to great success in Ennis last summer. 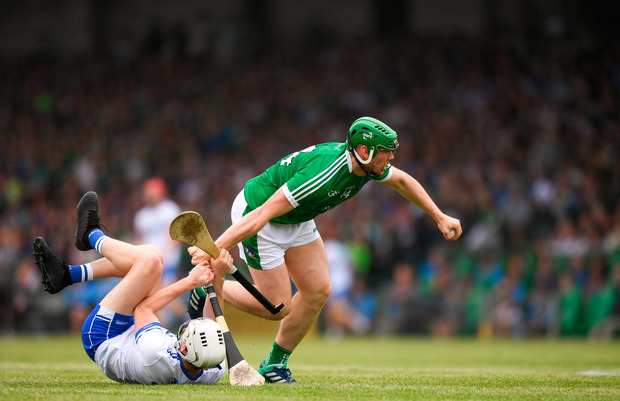 What Waterford have which Dublin didn’t – bar Danny Sutcliffe – is natural shooters out the pitch that can hurt Limerick and they can have plenty of joy in this department. Waterford are blessed with speed. We saw last week when Eamonn Dillon and Sutcliffe ran at Limerick that it unnerved them. They didn’t look comfortable and Waterford have the legs to do damage. If they can replicate what they did against Clare and take on the Limerick half-back line and put them on the back foot, they have a big shout but they’re going to need their big names like Austin Gleeson and Jamie Barron to come with big performances for the 70 minutes. Talking to some Waterford supporters, it annoys me when people say, ‘Ah sure, if they lose hasn’t it been a great league and doesn’t it set us up for championship?’ That kind of talk drives me mad. We’ve only won five national titles – two All-Irelands and three leagues – in our history and after losing their last four finals (2017 All-Ireland, 2015/’16 Munster and 2016 league), another defeat would make for difficult reading. My best sporting memories are of winning titles and there’s nothing like that half an hour afterwards with a trophy sitting on the dressing-room table. If Waterford prevail, it does nothing but good for confidence and develops that winning mindset. We had a great run in 2007 on the back of our victory, as they did when they last won it four years ago. It sets you up nicely for the championship. The best two counties have made the final but it’s a pity that some counties now view the league as some teams see the FA Cup in soccer. There are only three big trophies on offer so you should go and try to capture all three. If you look at Man City and Pep Guardiola, he’s going for every trophy and he’s 100pc right. That has always been the Cody and Jim Gavin mantra as well. When you look back in August, you ask yourself, ‘What did we win?’ Only one county can lift Liam MacCarthy so you should chase every trophy that’s going. A lot of counties are turning their nose up at the league and are nearly happy to have it over and done with and I will never get my head around that logic. Any element of shadow boxing or thinking about their Munster date in May won’t cross Fanning’s mind. Croke Park and Walsh Park are chalk and cheese and I don’t expect those games to be similar. This is a once-off. Earlier in the week, my head said Limerick and heart said Waterford but as the game approaches, both are saying Waterford. Limerick are worthy favourites and have a full hand to work with but if Waterford come with a plan to shut down their short-passing game and can take them down the home straight, we might be celebrating our first national success at GAA HQ since 1959.